To promote and teach the game of rugby at its highest standard in a safe and positive environment. To develop each player to their highest potential and to instill the necessary skill to play the sport with passion. All players, coaches, officials, parents and fans are encouraged to remember that rugby holds a unique place in American sport. It is an international fraternal sport that is based on hard but fair competition, and camaraderie. The International Rugby Board (IRB), the governing body for rugby around the world, Charter states: “Rugby owes much of its appeal to the fact that it is played both to the letter and within the spirit of the Laws. The responsibility for ensuring this practice lies not with one individual -- it involves coaches, captains, players and referees. It is through discipline, control and mutual respect that the spirit of the game flourishes and, in the context of a game as physically challenging as rugby, these are the qualities which forge the fellowship and sense of fair play so essential to the game’s ongoing success and survival. Rugby is valued as a sport as it builds teamwork, understanding, co-operation and respect for fellow athletes... It is because of, not despite, rugby’s intensely physical and athletic characteristics that such great camaraderie exists before and after matches." 'Can I touch it?' Will the U.S. learn to love rugby? 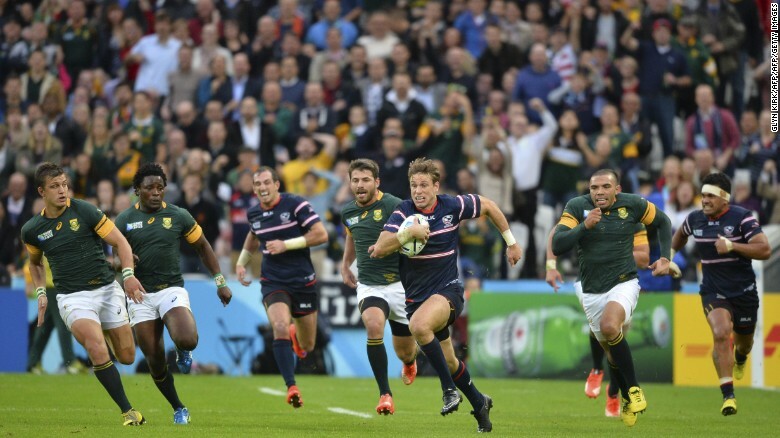 USA's Blaine Scully escapes South Africa's clutches during the Rugb World Cup pool match in London in October 2015. (CNN) It's the fastest growing team sport in the country, pulling in players from American Football, and the U.S. national side aims to be ranked within the top five in the world in five years. So is a sleeping giant of world sport finally awakening? Rugby, the oval-ball game involving scrummages, rucks, mauls and passing backwards, is on fast-forward in America again after almost a century in the doldrums. The sport was first played in the U.S. in 1874, when Harvard took on Montreal's McGill University -- but it was already being pushed to the margins before the U.S. won back-to-back gold medals at the Olympics in 1920 and 1924. 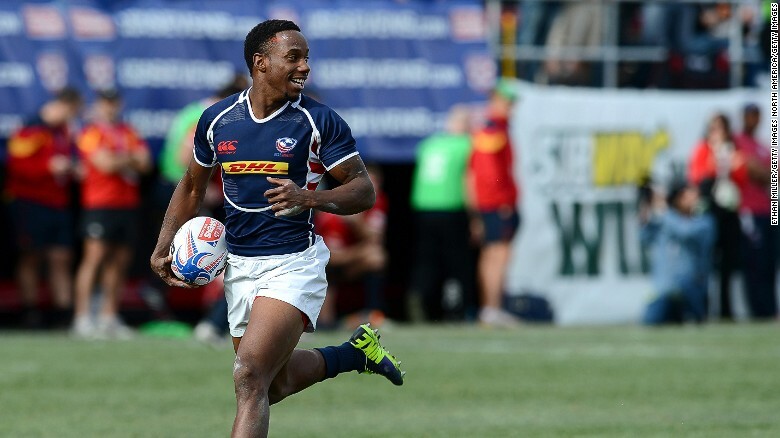 Sevens specialist Carlin Isles is one of U.S.A. Rugby's biggest stars - he can run 100m in 10.13 secs, which would have qualified for the semis at London 2012. Now there is a momentum being created to grow the game again, aided by the return of the seven-a-side version -- as opposed to the traditional 15-man format -- to the Olympics in Rio this year. "We might have been here since the 1870s, but it's only in the last six or seven years that people have started to get to know the word rugby and see it on TV," says Nigel Melville, the former England captain who has been chief executive of U.S.A. Rugby since 2006. "You don't have that in traditional rugby countries. It was either that or: 'Oh yeah, I played in college.' So we're starting from some way back, but we're making good progress." 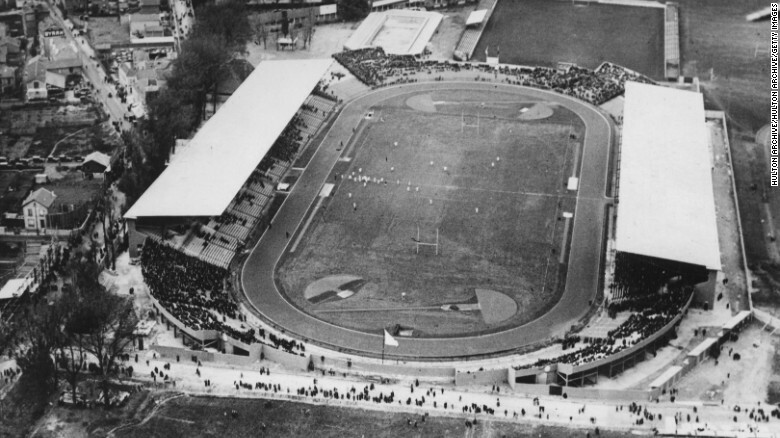 The U.S.A. beat France in the final of the 1924 Olympic rugby tournament in Paris - the last time rugby featured at the Games. According to figures from U.S.A. Rugby, there are more than 115,000 registered rugby players in America. Of those, 32,000 are in colleges, with the rest in high schools and clubs across 48 of the 50 states. Twenty-five percent are women. A separate report from the Sports Fitness Industry Association in the U.S. puts the number of participants in rugby at 1.2 million. A match between the U.S.A. Eagles, the men's 15-a-side national team, and New Zealand's All Blacks at Chicago's Soldier Field in 2014 demonstrated the potential audiences in America, drawing a record crowd of 61,000. This weekend's Las Vegas round of the World Sevens Series, the global seven-a-side competition, offers another chance to grab the attention of a football, basketball and baseball-loving public. "Sevens is quick, it's end-to-end, there's lots of scoring and lots of breaks -- but it's simplified, so once you understand sevens you can understand 15s," says Melville. And perhaps rugby is also benefiting from fears that American Football is becoming more dangerous. "Rugby fits the needs of many sports fans," says Melville. "It's a team sport, and Americans love team sports. They love sports played with hands rather than feet -- that's just traditional -- and they love contact sports because football has become a mainstay. "But a lot of people are a little bit concerned about football's safety, and they see us as a safer option. "There is a perception that because you have a helmet you use your head as a weapon. You're not going to do that in rugby. "We push very hard on technique, in that wrapping with the arms is very important, and putting your head to the side of the body. "Our youth programs play non-contact, and that's very attractive for parents. And being an Olympic sport brings you credibility." U.S.A. Rugby has invested heavily in the sevens game, with full-time programs, and the move has paid off with both men's and women's teams now ranked in the top 10 in the world and having qualified for Rio. In 15s, the Eagles have qualified for every Rugby World Cup but one since the global tournament -- the world's third-largest sporting event -- was introduced in 1987, but have never reached the knockout stages. The team ranks 17th in the world, one place below Romania, while the women are sixth. All should be higher, according to Melville. "I see them all being in the top five in the world," he says. "That's where they need to be. There is the potential. There are enough athletes coming through the sport now. Louis Stanfill (centre) feels the emotion as U.S.A. prepare to take on South Africa at the Rugby World Cup in England in October 2015. "If we can get them into full-time training environments with great coaches and conditioning, like we have with our sevens, we can make a lot of progress." The challenges, though, are myriad -- not least geographically and because of an "extremely competitive marketplace." "We're doing it on a shoestring," says Melville. "It's very difficult. There isn't lots of money out here washing around for sports, and it's very hard to unseat those huge, traditional sports." 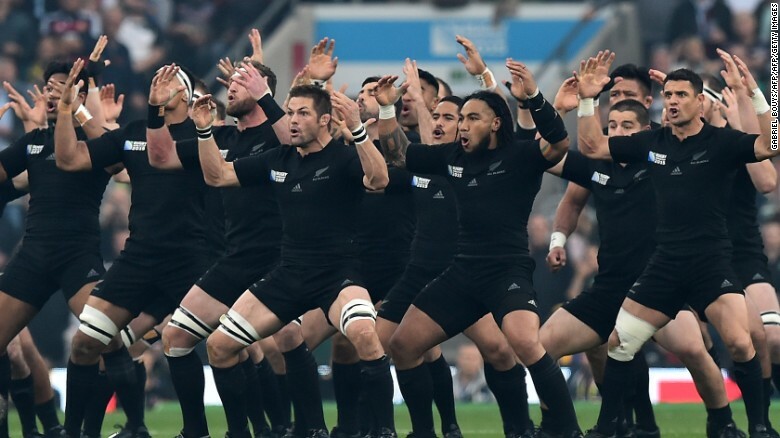 New Zealand played the U.S.A at Chicago's Soldier Field in 2014 in front of a crowd of 61,000. Infrastructure, however, is being put in place -- a new domestic league, the Professional Rugby Organisation (PRO), will kick off with six teams in April. The Eagles players, led by former All Blacks coach John Mitchell, are involved in the recently launched America's Rugby Championship, which involves the U.S., Argentina, Canada, Brazil, Uruguay and Chile in a competition akin to Europe's Six Nations. 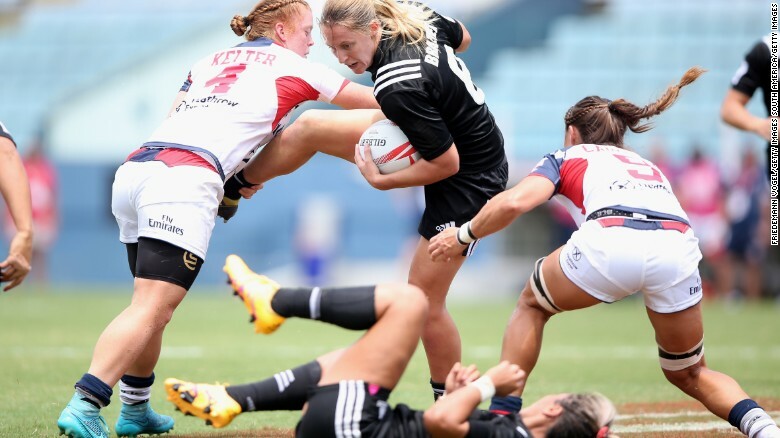 The U.S. will also host the April round of the Women's Sevens Series in Atlanta, while it won the bid process to host the 2018 Rugby World Cup Sevens event in San Francisco. The rest of the world is waking up to the potential U.S. market. New Zealand returns to Chicago to take on Ireland in November, while England's Aviva Premiership stages its first match in the U.S when London Irish takes on Saracens at New York Red Bulls' 25,000-capacity Red Bull Arena in March. Atlanta will host the next round of the Women's Sevens Series in April. Getting the global concept of the sport across with international jamborees such as the Las Vegas Sevens is the key that opens up many more doors, according to Melville. And he believes one of America's greatest strengths lies in the diversity of its rugby-playing population, with areas such as the north-west, Texas and Colorado catching up with traditional heartlands like the north-east and the Pacific coast. "We're not a white-collar sport as you would call it in England," he says. "We're very diverse. It's not about how much money you have or what school you went to, it's about whether you like playing rugby. "The passion of the rugby community is awesome. It is a little bit of a throwback in many ways. People will travel up to 12 hours for a rugby game and think nothing of it. 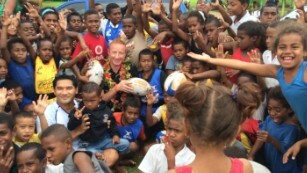 "Some of the more mature rugby nations take for granted what they have got. We certainly don't. We know the challenges of trying to compete with the bigger nations. It is incredibly tough, but we're making great progress." Rookie Rugby, (touch rugby), is USA Rugby's brand of flag rugby! It is designed to give players a fun, safe, and exciting rugby experience. The rules are simple, the game is easy to learn and minimal equipment is needed! Rookie Rugby is the non-contact version of rugby that has been developed for schools and communities to introduce their young athletes to a fun sport! Play is free-flowing and continuous, with running, passing, and scoring! Flag or two hand touch may be used, Rookie Rugby is designed for boys of all ages, and curriculums have been created for different age groups. Rookie Rugby promotes TEAMWORK, HEALTH and FITNESS, excellent SKILL, and FUN! !